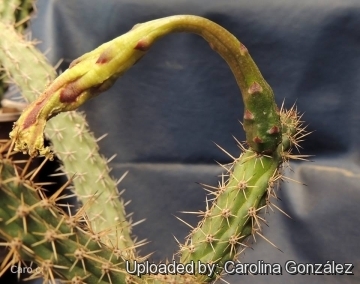 Origin and Habitat: Praecereus saxicola is distributed in Argentina, Brazil, Bolivia, and Paraguay. This species is common and abundant throughout its range. In Brazil it is patchily distributed. Altitude range: This species occurs at low elevations of 100 to 500(-900) metres above sea level. Habitat and Ecology: This species occurs in many different habitats in the Chaco region. It frequently forms dense colonies in the sotobosque. In the northeastern portion of its range it grows in rocky areas. The native people eat the fruit of this species. It is also eaten by animals. In most of its range there are no major threats to this species. In Brazil, the main threat is habitat loss from deforestation for plantations for biofuels and livestock ranching. Description: Praecereus saxicola (also known as Monvillea cavendishii or Cereus rhodoleucanthus) is a sparse to richly branched thicket-forming shrub that scramble on the ground or work its way through tree branches. The fast-growing, stems can reach a height of more than 2 metres and 1.5 to 3 in diameter, and bear fine, short spines. 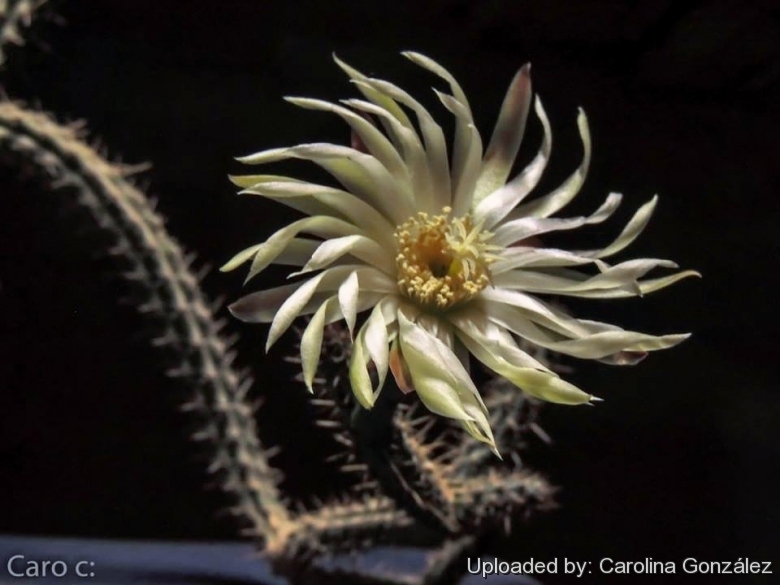 Praecereus saxicola is the best-known species, and is a prolific bloomer, putting out its nocturnal white flowers from from spring to autumn. Derivation of specific name: 'saxicola' Latin 'saxum', rock; and Latin '-cola', inhabiting; Because it often grows on rocks. Stems: Rather slender, cylindrical, flexible, ribbed, more or less branched at base, upright, arching, decumbent or clambering 1-3 m long, 2-3 cm, pale to dark green or blue green. Ribs: 6 to 9 low and rounded. Areoles. Small 5-15 mm apart. Central spines; 1-4 needle-like up to 1.5(-2) cm long, dark brown or black. Radial spines: 6 to 9 needle-like or bristly, white to yellowish brown with black tips, 2-6(-10) mm long. Flowers: Funnel-shaped, hermaphrodite, actinomorphic, nocturnal, greenish white up to 10-13 centimeters long, 6-10 cm wide, outer perianth-segments pinkish or greenish, inner white, acute. Pericarpel small, with small scales naked in their axils; tube 5 to 6 cm long, with more distant scales, these broader than long, with minute brown chartaceous tips. The flowers arise from near the top on the sides of the stems. Fruits: Spherical to ellipsoid, up to 5-7 cm wide, 4-5 centimeters in diameter fleshy, red, often grooved, almost naked or with sparse scales. The withered perianth persistent. Blooming season: Praecereus saxicola is a prolific bloomer beginning to produce flowers in late spring and continuing into early autumn. Seeds: black, obliquely obovate in outline. 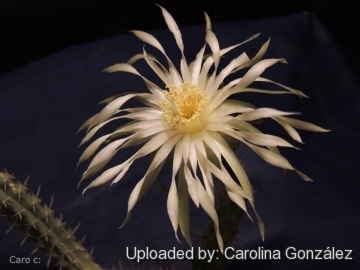 History: The first description was published in 1893 by Thomas Morong as Cereus saxicola. Nigel Paul Taylor set it the genus Praecereus in 1997. Synonyms include Cereus cavendishii Monv. 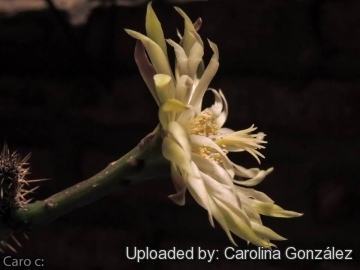 (1839) and Cereus rhodoleucanthus K.Schum. (1899). 2) Kiesling, R., Oakley, L. & Pin, A. 2013. Praecereus saxicola. The IUCN Red List of Threatened Species 2013: e.T152756A674714. http://dx.doi.org/10.2305/IUCN.UK.2013-1.RLTS.T152756A674714.en. Downloaded on 20 February 2016.